Using Implicit styles gives you the ability to easily extract and edit the default ControlTemplates of the controls. You can follow this documentation article on how to extract the ControlTemplates. Border - represents the border and the background of RadWizard and is of type Border. PART_SelectedPagePresenter - hosts the selected page and is of type ContentPresenter. Border - represents the border and the background of WizardPage and is of type Border. PART_SideHeaderBorder - represents the border of WizardPage’s SideHeader and is of type Border. PART_SideHeaderPresenter – displays the content of WizardPage’s SideHeader and is of type ContentPresenter. 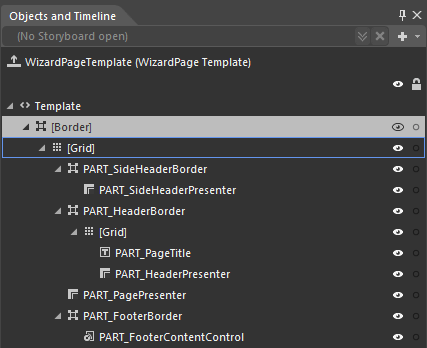 PART_HeaderBorder - represents the border of WizardPage’s Header and is of type Border. Grid - hosts the elements of the header and is of type Grid. PART_PageTitle – displays the title of a WizardPage and is of type TextBlock. PART_HeaderPresenter – displays the content of WizardPage’s Header and is of type ContentPresenter. PART_PagePresenter – displays the content of a WizardPage and is of type ContentPresenter. PART_FooterBorder - represents the border and the background of WizardPage’s Footer and is of type Border. PART_FooterContentControl - displays the footer of WizardPage and is of type ContentPresenter.